Gigaquit, officially the Municipality of Gigaquit, is a 4th class municipality in the province of Surigao del Norte, Philippines. According to the 2015 census, it has a population of 20,864 people. The name is derived from the words gigad (meaning "shore") and gakit (meaning "bamboo raft") and refers to the means of transportation that the early settlers used to travel from the inland to the shore. Gigaquit is politically subdivided into 13 barangays. Gigaquit was established in 1850 by Cero, a native who fortified the place to make it safe from Moro raiders. During this period, the local population was Christianized by priests from religious orders who made Saint Augustine their patron saint. Bacuag and Claver, which had been part of Gigaquit, became separate municipalities in 1918 and 1955 under Executive Order Nos. 61 and 126 respectively. ^ a b c "Historical Background". Gigaquit. 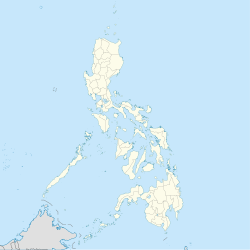 Province of Surigao Del Norte. Retrieved 29 August 2013. This page was last edited on 24 February 2019, at 09:22 (UTC).